Adland digs deep into what advertising means – to the people who work in it, to the Internet gurus, to the rest of us who consume advertising. It is about the nature of the vocation and the reincarnation of a multi-billion dollar industry in the information age. The chapter entitled “Idea Factories” chronicles unique advertising agencies such as 42 Entertainment, Toy New York, Fahrenheit 212, Droga5 as well as BBDO, Goodby, Silverstein & Partners, and Time Warner Global Media Group. Jim Othmer is a former creative director at Young & Rubicam, author of the novel, The Futurist. 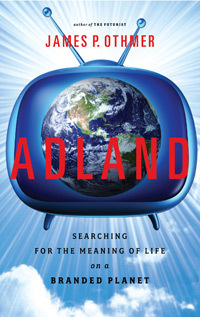 Excerpted from Adland by James P. Othmer Copyright © 2009 by James P. Othmer. Excerpted by permission of Doubleday, a division of Random House, Inc. All rights reserved. No part of this excerpt may be reproduced or reprinted without permission in writing from the publisher. If you wish to purchase a copy of the book, click here.